The best investment you'll ever make! Carpet cleaners know that real gold is yellow – and found in carpets, not caves. 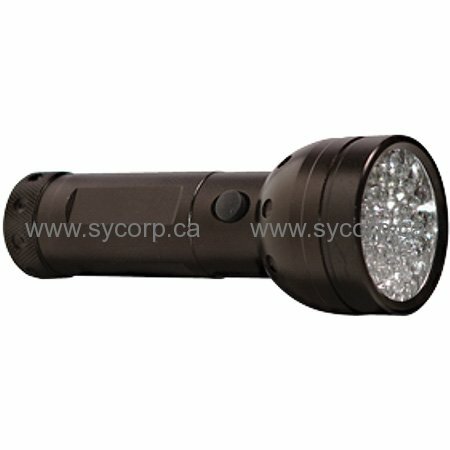 This high-powered, 51 LED UV light is built specifically for urine detection and will have you screaming "Eureka" all throughout your customer's house. The lights are tuned to work in the 385-390nm range of the UV spectrum and waste very little energy in the spectrum of light that doesn't cause the molecules in urine to fluoresce. Translation: more battery power is devoted to detecting urine stains, not lighting the room. Durable is an understatement for this light. The UV light is water resistant, shockproof and the rugged aluminum body will protect your light from mishaps in the van. LED lifetime is an impressive 100,000 hours and will run for hours on three AA batteries. Don't get stuck with a dead light! Rechargeable lights can provide unpleasant surprises when you show up to a customer's house and discover your battery is dead. Keep a spare set of batteries handy and you'll never be without your gold detector. Amber glasses are highly recommended for detecting urine. These glasses are inexpensive and will greatly improve the contrast of any urine stain - a must with any UV flashlight.